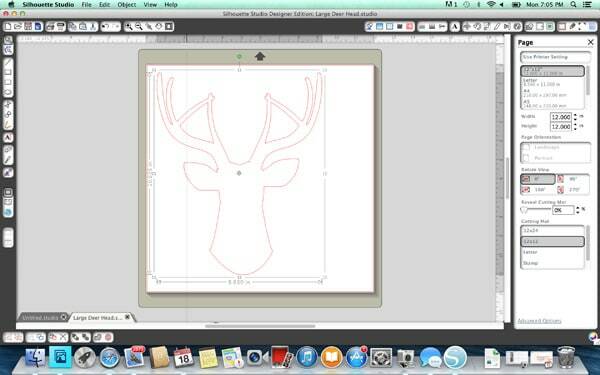 Note: You do not need to own a Silhouette in order to recreate this Silhouette Deer Head Appliqué. Read more to find out how. I’ve been using my Silhouette* a lot lately. I purchased it two years ago through the Silhouette Black Friday Sale. My favorite way to use my Silhouette is cutting out a simple shape and appliquéing it to a towel, t-shirt, burp cloth, etc. It embellishes the ordinary and makes really cute hand-made gifts. 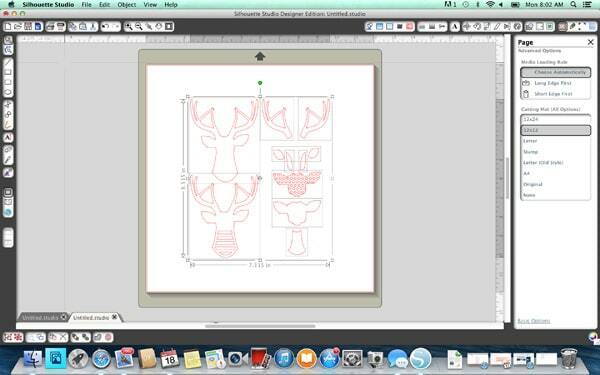 (*affiliate) And, that’s how I came up with the Silhouette Deer Head Appliqué idea. Last week I was visiting with a friend who recently had a baby and I wanted to bring a small gift. 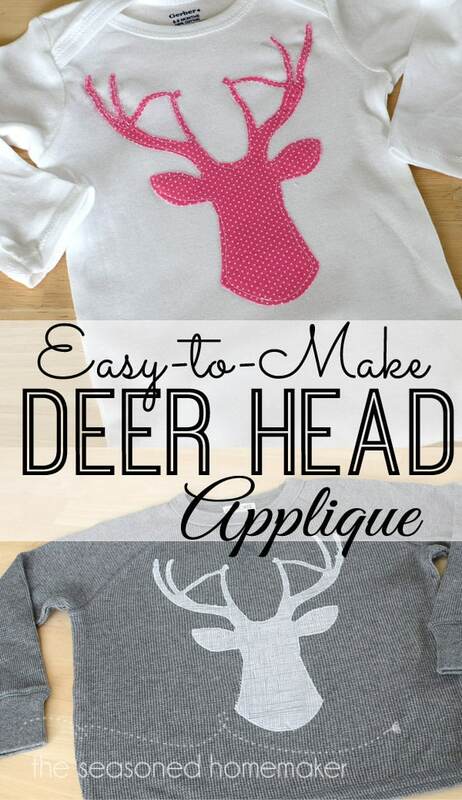 I saw this Deer Head Applique idea on the Silhouette blog and knew it was perfect. That’s what I love about my Silhouette. They have a ton of ideas and a ton of tutorials. I made shirts for my grandsons, a onesie for my granddaughter, and a baby gift. It took me less than 2 hours from start to finish. First, I went to the Silhouette Online store and purchased the Finnley Patterned Deer (just like the blog tutorial) for $.99. It instantly loaded into my Silhouette software and I was ready to get started. 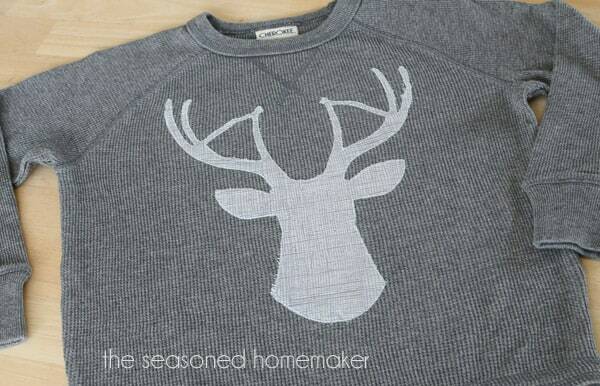 Note: You can download Silhouette’s software for free in order to recreate this appliqué. The only difference is you will have to hand cut the design. The design has lots of details and is broken out into its many parts in the software. I used the break-apart button in the software and separated out the design features. Then I deleted everything except the deer head. I then added fusible web to the back of my fabric, peeled off the waxy backing, and pressed the fabric to my cutting mat. Once the machine was connected to my computer, I hit the Send button and loaded the design into the machine. After that, it was only a matter of adjusting the cut settings. Since the machine has a pre-set for cutting fabric with fusible web, there isn’t much to this. 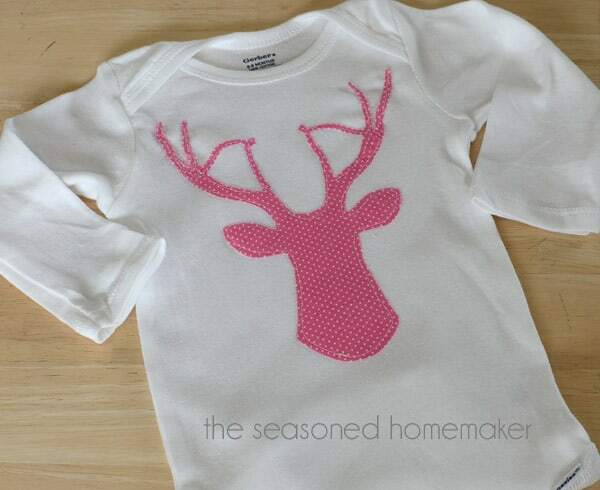 Once I had the designs cut out I ironed them onto the onesies and shirts then top stitched. 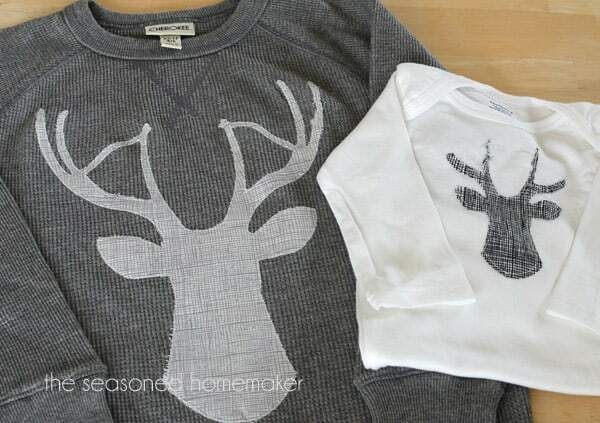 On the onesies, the antler details were pretty small and I had to trim them to fit. I used a straight stitch on both of the onsies and a small zigzag on the two t-shirts. While this may seem like a great idea for boys, it’s pretty darn cute for a girl, too. This was such an easy project to make. Once the two shirts were finished, I put them in a big jar and left them on Kitty’s front porch. A little later she texted me and said the boys loved them and wouldn’t this be cute on a pillow! Hmmm. I feel another project coming on. I love this design so much I’ve since used it on two small quilts. Don’t be afraid to try this ~ even if you don’t own a Silhouette, yet. It’s so easy ~ anyone can do this. I saw this on Sugar Bee Crafts: Take-A-Look and had to pin it! My grandsons would love these. I know my grandsons love them – I’m sure yours will too. Ooh, Leslie … I have one of these on my “Dream Wishlist” , I so badly want one. I’ll have to look online for special prices during the holidays! I like how you were so detailed in your instructions. That will help newbies like me. Everyone have a wonderful, safe and HAPPY THANKSGIVING. I’m not spilling any beans here – but check back on Thanksgiving for something really special! These are precious! I love it! And you are right…the pink one is fabulous! Get my Silhouette today! SUPER EXCITED! 12:01 am – here – best deal this year! I LOVE these! From the linked image, I thought it was an Adult shirt…I want one for myself, although my boys would love them too. Thanks for sharing! I LOVE this! When I see projects like this I sure wished I sewed. And way to take orders?? I’m pinning this one to our talent board! Thanks for sharing on DIY Sunday Showcase. This is darling. Silhouette’s scare me – because computers scare me – but this is so cute. I love that you used it for a boy and a girl. Thanks for sharing! This is so cute. Thank you so much for sharing with Wednesday’s Adorned From Above Link Party. Have a great week. 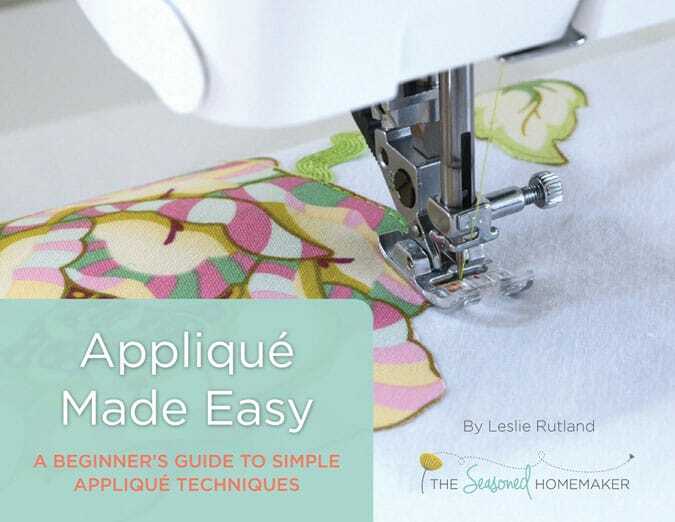 Oh my goodness how I love that applique design! Thanks so much for sharing it at the DIY Sunday Showcase! These are darling. Can you use the regular blade to cut fabric? I have only done vinyl on my silhouette so far. Silhouette makes a fabric blade. It is really a regular blade with a blue cover. This helps you remember not to cut paper with your fabric blade. Totally worth it in my opinion. Hi! I love these!! Anything with deer silhouettes are so pretty. So cute! Thanks for sharing at the Twirl & Take a Bow Party! So glad to have you join in the fun! Is there anywhere you can go that show all the steps needed to operate a silhouette machine? I have a friend who bought one from a crafting buddy who thought it was too difficult to mess with and she would love to learn how to use it. I love this!! I have a new little lady in the house and think her and her siblings need Momma to make matching ones!!! 😉 VERY cute!! Thanks for sharing! Another reason I *need* a Silhouette machine! Love this! I may have to try making a sweatshirt with one of these for my niece for Christmas. Please come join the link up party at somuchathome.blogspot.com. I would love for you to share as many of your great posts as you’d like. I host a new link up party each Wednesday, but the link ups last a whole week, so you can link up at any time. God bless. What a great project! I love the applique and love even more that you used your silhouette to create the design! I will be featuring you tomorrow night on Creativity Unleashed, thanks so much for linking up! I’ve bee meaning get into fabric cutting with the silhouette. DO you find the blade dulls out faster?